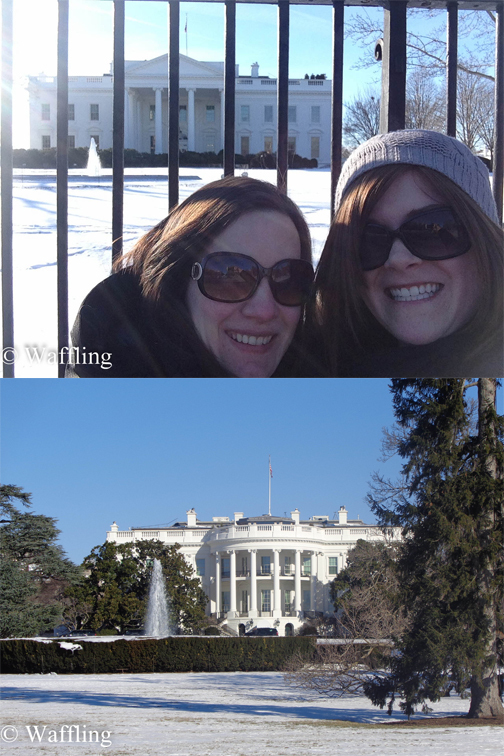 Sarah and I took off for a girl's weekend in Washington DC this past weekend and we had SUCH a crazy good time!!! We arrived Thursday night and checked into our hotel, which we had booked based on it's low price on Expedia- The Renaissance. It was sooo nice and we had no complaints about our stay there!! We stayed in an area of town called Foggy Bottom, which made us giggle, but was also a great location for getting around town easily. That night we went out for a very late dinner and a celebratory beer at Founding Farmers- I actually tried a lot of local beers on my weekend in DC, but do not ask me what I had because I can barely remember. The next day we had a leisurely sleep in until 9am (a lot of museums open at 10am) and then we went on a tour of the Bureau of Engraving and Printing and learned how money is printed! Pretty cool tour and also free so worth a stop. Almost all the museums and government tours are free so Washington was an amazing place to shove in a lot of knowledge :). After The Bureau we went to the Holocaust Museum next door- it really is an amazing place. There is not much I can say on it except that you have to go when you are there. We left with heavy hearts and wandered out afterwards for our next stop. After a quick food-court stop we walked over to the Natural History Museum. We thought we would only have time to do one museum a day so getting to see more was pretty nice. The Museum was definitely interesting, even if our feet were getting tired. They had a whole section on genetics that was really interesting and they had volunteers in who were doing an experiment about genetic traits and we mapped some of ours and added it to the list they had going. 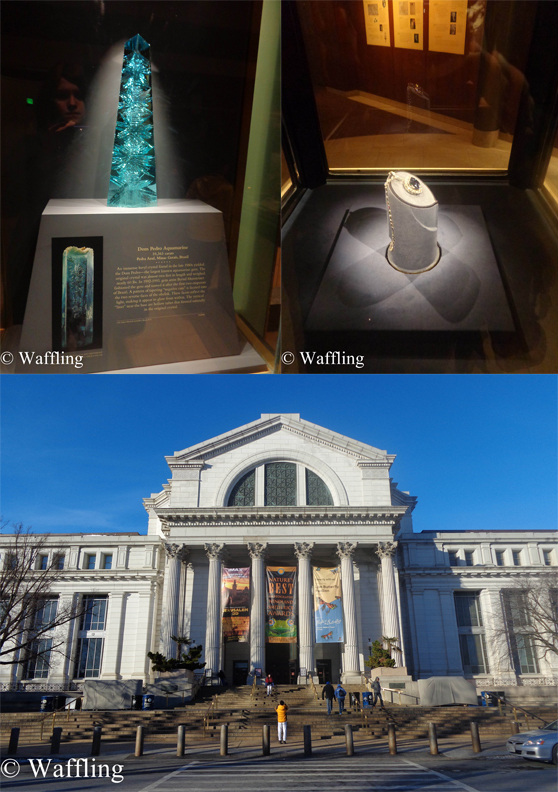 They had sections on all sort of things- the ocean, dinosaurs, bones, mammals, insects, gems, and the evolution of man. After the Museum we travelled down the subway for our night tour of the city by Old Town Trolley. Side note- Sarah and I were so confused about how to pay for the subway and at one point in our trip we got a free ride somehow! But we figured it out by the end! Before our tour we went to The Dubliner, where we each had the most gigantic chicken pot pies! But then we got right on our tour at 7:30pm. 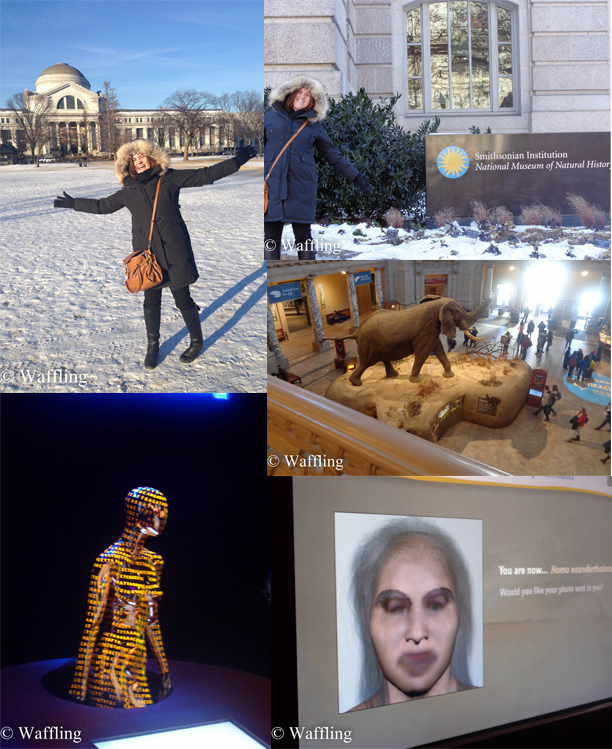 It was highly educational and entertaining- but the coldest I have ever been in my LIFE. The bus was fine, as the windows were covered in thick plastic, but every time we got out at a stop we would hurry over to the memorial, take photos, and then scurry back on the bus. brrrr! Our bus driver (Jason- he does Friday & Saturday night tours and is awesome), even dropped us right back at our hotel at 11pm and we went to bed very tired from our first day!! Saturday dawned cold again (it was supposed to be somewhat warm this weekend but it never happened). We headed over early to the Library of Congress to squeeze in a quick look around before our scheduled tour of Capitol Hill. 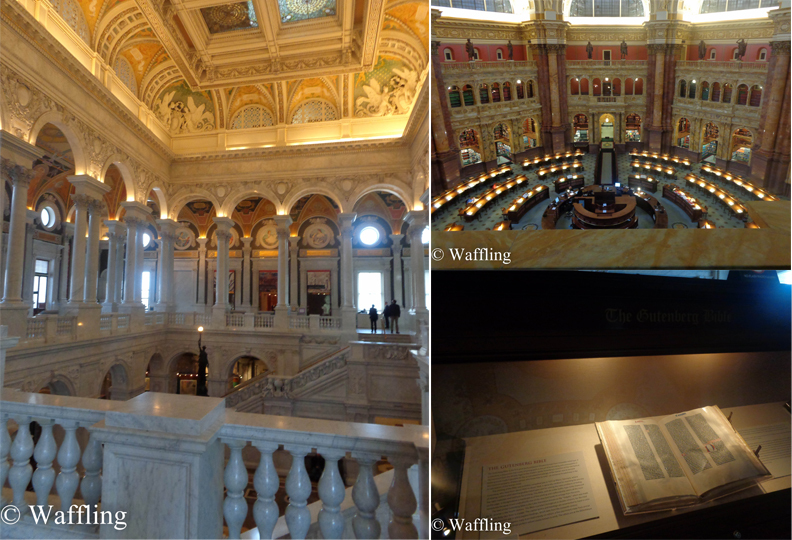 We both really enjoyed the library- it was STUNNING! And the Capitol Hill tour was very educational and our tour guide was great on this as well. After our tour was over we headed over to the Air and Space Museum! Our legs were so sore at this point, and it is a big museum, but we took our time and tried to see everything. 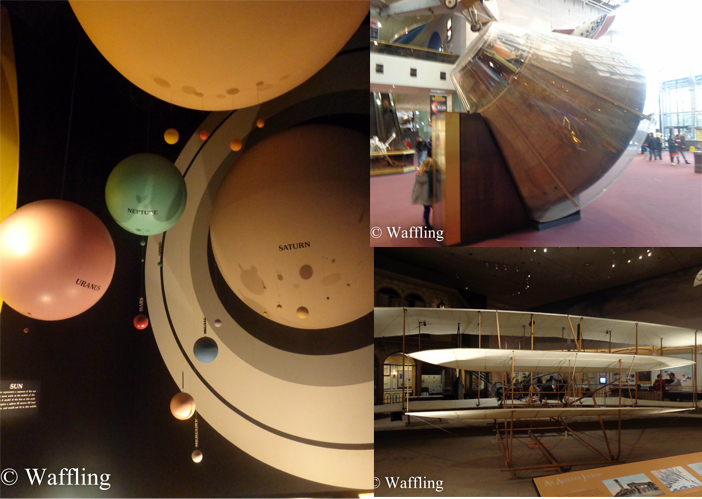 It takes you right through from early technologies in flight to space ships- the Apollo 11 and the Wright Brother's plane is even there! After the museum we were exhausted, but not willing to call it a day yet! So we took took the subway back to Foggy Bottom and walked over to Georgetown, which is a scenic street for shopping. The only thing I bought was an amazing white coat I picked up from Banana Republic- $40 marked down from $250 (It was this coat, which apparently is $310 in Canada??)!! 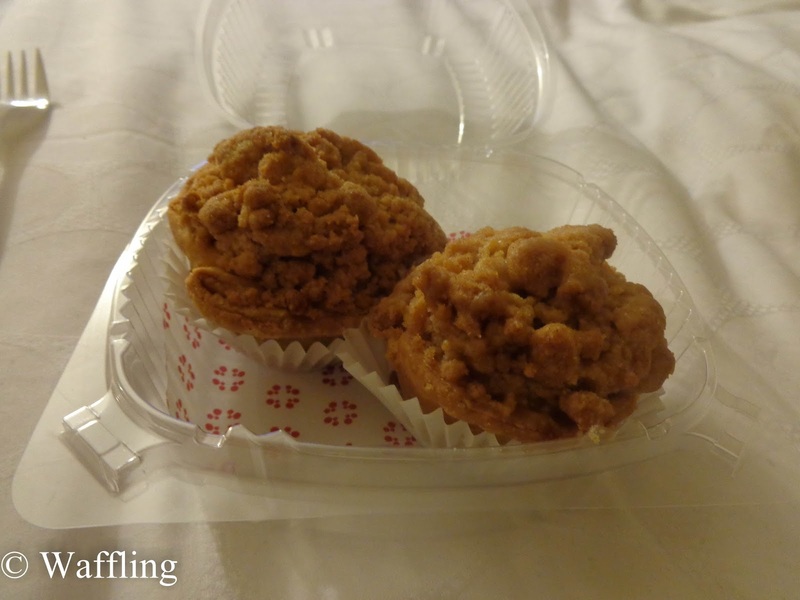 Sarah had the amazing idea that we should buy a pie and just chill in the hotel for the night so we walked down to Pie Sisters and picked up a selection of mini-pies. We saw Georgetown Cupcakes from the TV Show (I have never seen it, but Sarah had), but the line was huuuuuge. I recommend the pie store ;). 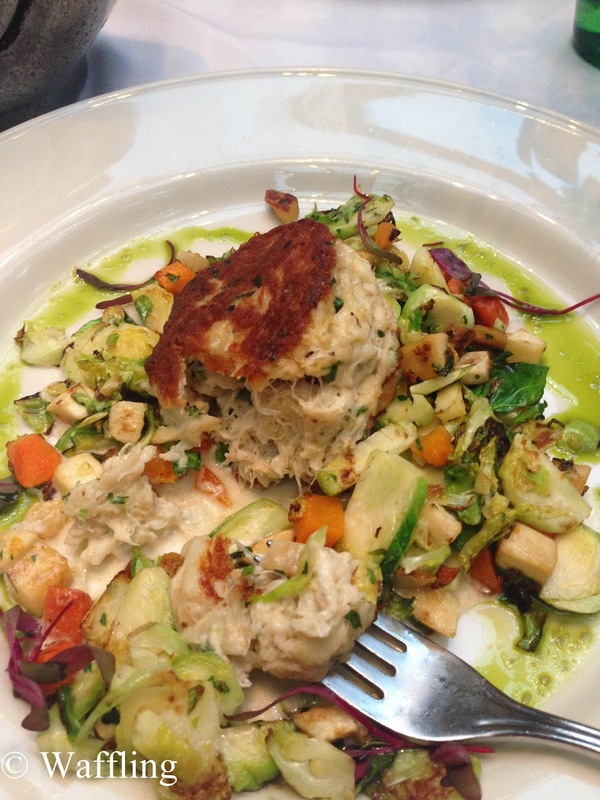 We then went for dinner at Clydes and I had a scrumptious crab cake/brussels sprouts dish. I swear Sarah and I barely made it home after dinner- our legs were just completely shot from two days of solid walking. I seriously felt like Frodo walking up Mt Doom. We had planned to go out for a drink Saturday night but that clearly wasn't happening. We spent our evening eating pies (I had jumbleberry and caramel apple- the jumbleberry was the favourite of both Sarah and myself) and watching the X Games on ESPN. Sunday morning we woke up to another cold day- though not as windy, which was nice! We walked from the hotel to the White House for a few photos (they no longer have tours open to the public unless you book over a month in advance with your embassy). We really wanted to get a cheesy "oval office" photo op done at the visitors center but it was closed for renovations!! So sad. After the White House we decided to walk down to the American History Museum, which originally wasn't on our list of museums, but we had completed all the must-sees and our Trolly Tour Guide on Friday raved about this one, plus we had heard good things from others. It actually was pretty great- and allowed us some much needed cheesy photo ops :) After this museum, we stopped in at the Postal Museum, which is smaller, but still pretty interesting! By this point our legs had given up on life once more so we headed back to the hotel for a nap! 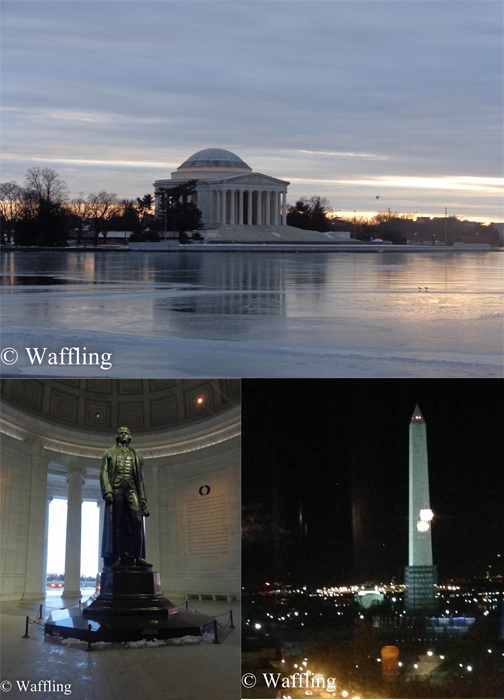 We thought we might be just DONE for the weekend, but we had a second wind after our naps and headed for a walk out to the see the Jefferson Memorial, which was one our trolley tour didn't do. 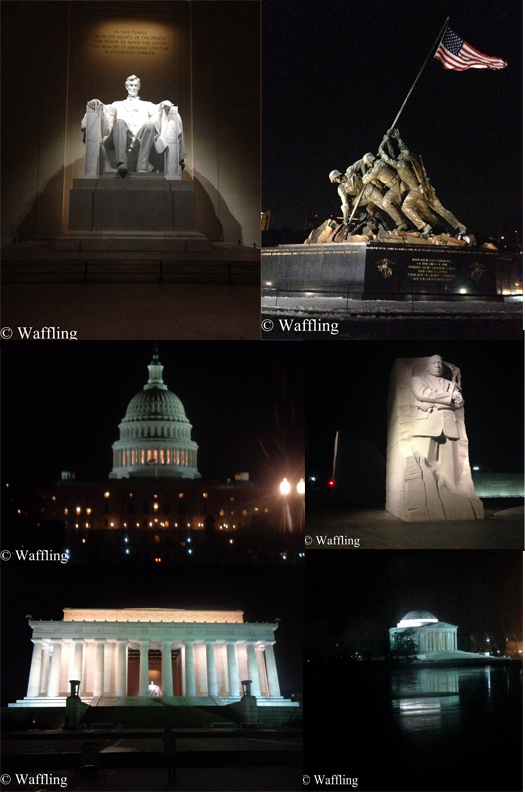 We had hoped to do a whole walk of the National Mall (where all the monuments and memorials are), but it was pretty cold and we were pretty tired- we were very glad to have seen a whole lot of them on our night tour! After that we walked to Old Ebbit Grill for dinner! I had a salmon fettuccine, which was alright, but Sarah said she loved her cod, and the restaurant was really nice and we were glad we had stopped in. And next door was the bar that we had planned to go to Saturday night- POV! It was completely dead on a Sunday at 7pm, but the views up there were pretty amazing for a city with no tall buildings (see photo of the Washington Monument above!). 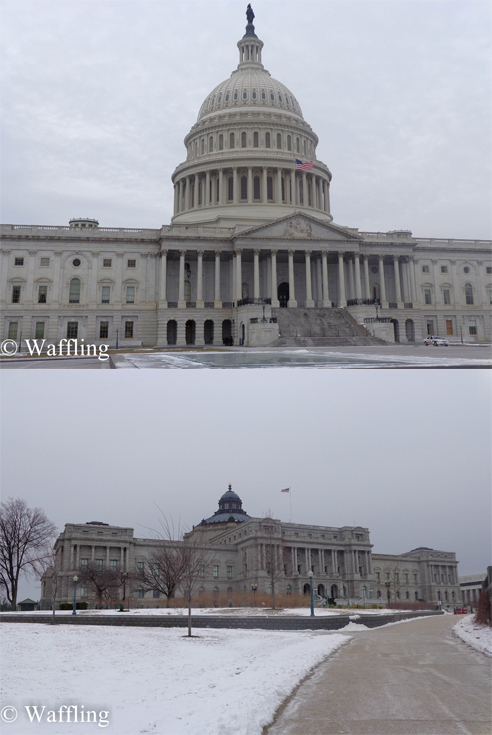 There is also a great patio, that overlooks the White House and is heated in the winter, so it is bigger than it seems. We each had one overpriced, but delicious, drink and then headed back to our hotel. On our way back we picked up milkshakes from Burger Tap & Shake by our hotel- totally amazing and I definitely recommend the place! Then it was early to bed because we had to be up early for our flight home! We spent a bleary-eyed morning at the airport, where our flight was delayed due to bad weather in Toronto. Our plane only had about 5-10 people on it too!! It was a very bumpy flight back, but we landed around 11am and I was in bed for a well deserved nap by 11:30 (I love living across the street from the airport!). Overall Sarah and I had an amazing weekend- VERY tiring, but we saw so much and we enjoyed it so much! I would definitely recommend going in the winter because it wasn't very crowded, but I would like to see it in warm weather someday too! We are already planning next year's weekend getaway! When we went it was middle of summer and so hot that we couldn't actually see everything! Also, it was insanely busy, we were lucky if we could get to the gate at the White House. And, I've shopped in Georgetown! Such a cute little street! There were only a handful of us at the gate! At almost all the sites there were just a few people. The museums were pretty busy, but you never had to wait to get up close to any exhibit. Going in the winter was great, even if we froze a few times!! 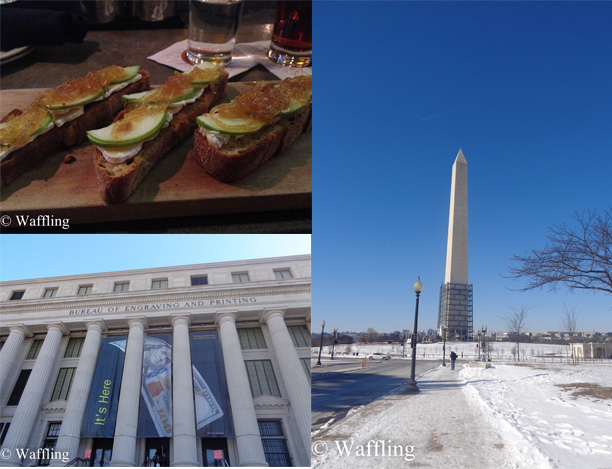 Whoa, you probably got more of DC in your one weekend than I have in my 5-10 visits to DC! As for visiting in summer - it's a sticky, swampy mess in summer (worse than NYC)! Yes, we did jam pack a lot in there and my shin splints are proof of that! We both thought the spring or fall would be nice to visit in too! We were down there this weekend too! (Though we only live an hour away.) The cold snap down there was unusual, otherwise, you picked a good time to go. Holy cow you were in my city and I didn't even know it! I went to grad school in Foggy Bottom. You'd know why they call it that if you were here in August when it is sweltering and muggy. 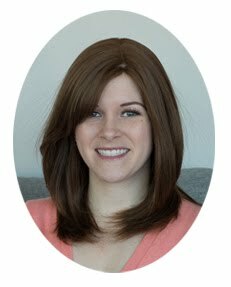 Exactly the opposite of what you experienced! If you ever come back, let me know and I can recommend all of the hidden gems. 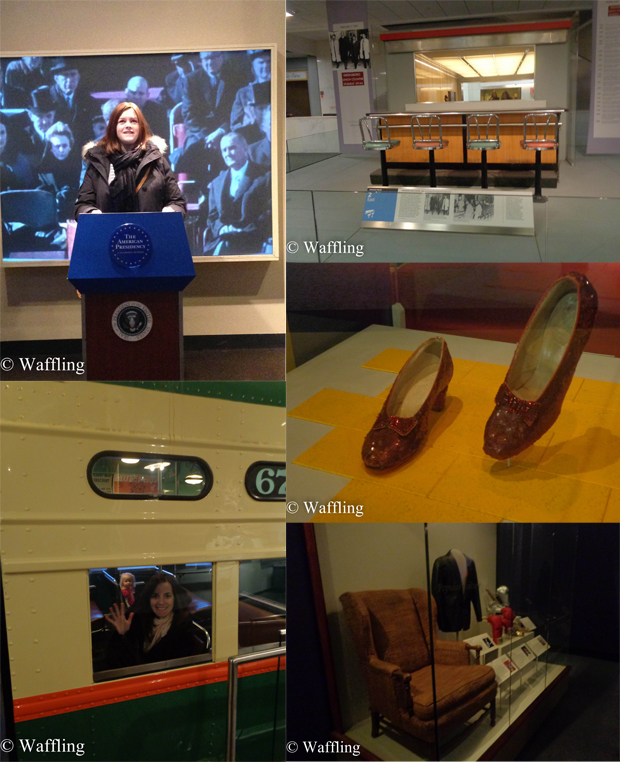 But for your first trip to DC, you certainly saw many of the must-sees! Oh I didnt know you were in DC! Yes, Ive had a lot of people tell me it isnt pleasant in the summer!